Environmental watering in the Snowy River aims to rehabilitate river reaches below Jindabyne Dam by moving sediment, establishing plants and boosting carbon. To achieve this, environmental water is released every day of the year. There are bigger releases in winter and spring to recreate flows that would have resulted from rainfall or snowmelt. The East Gippsland Catchment Management Authority (CMA), along with scientists from the Arthur Rylah Institute, has undertaken research to determine whether environmental watering can benefit the growth and breeding of estuary perch and Australian bass in the Snowy River estuary. 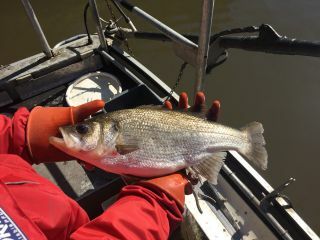 "Our research is telling us that environmental watering in spring may benefit the growth of young fish of both species," said the CMA's Liz Brown. "We also know that when the estuary is open, the flows assist to keep the estuary open longer than might otherwise be the case, benefiting recreational anglers and local tourism operators." 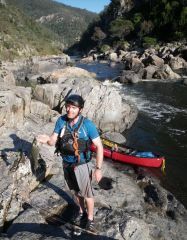 Lynton Hill runs whitewater rafting tours on the Snowy River. He has noticed the increased environmental watering during the past five years has had a positive effect on the river. "We see consistency of water, increased water clarity, reduction of stagnant pools, reduction of silt and algae on the banks, reduction of stream bed vegetation and a deepening and more defined river channel," said Lynton. He said the river now looks like how older locals remember it. "The river has a more natural flow, with increased spring releases mimicking what happened before the dam." As a result of environmental watering, there are more recreational activities along the river including camping, fishing, paddling, swimming and sightseeing. "The river now has a sense of being alive," said Lynton. In recognition of the five Aboriginal groups associated with the Snowy Mountains rivers, the five winter/spring releases were named Djuran (running water), Waawii (water spirit), Billa Bidgee Kaap (big water season), Wai–Garl (river black fish) and Bundrea Nooruun Bundbararn (waterhole big lizard).